Populizr vs. Hootsuite - Pros & Cons | Which Is Better For Your Business? Social media strategy decides your online marketing success or failure if you are promoting your company or brand. Planning and organizing are essential. So, it’s necessary to use the proper tool to organize your site and to schedule your posts. There are several applications on the market, designed to boost social media traffic that will help you to save your time and stay organized. These applications will help you to stay coordinated across multiple networks by prioritizing and scheduling your tasks and posts. In this article, we’ll discuss Populizr vs. HootSuite. Let’s find out how these automated social media applications work and what they can offer for your business. HootSuite is an application for social media managing that allows users to schedule and post updates. With this tool, you can easily manage and monitor all of your social media accounts under one system. It’s a nice option for a team platform because you can also use it to delegate tasks to other users. Populizr is publishing automation tool for social media which allows people to manage their social media accounts from one dashboard. It will help you to increase your traffic by publishing and creating your social media content. 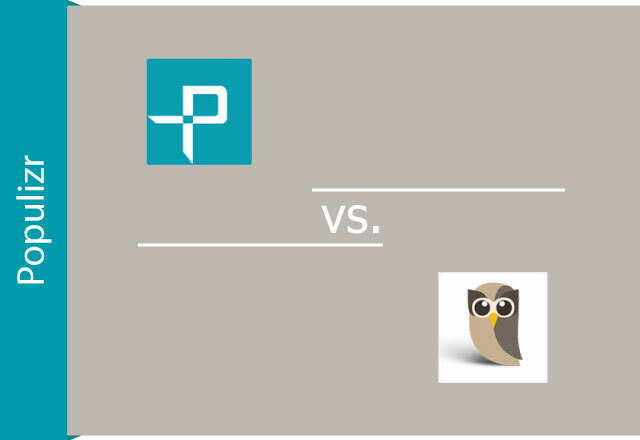 When you compare Populizr vs. HootSuite, do you know which platform offers better features? What are the main differences between these platforms? You’re in the right place because today we will give you a complete overview of these two platforms. Let’s consider several factors that will help you decide which one will win this social scheduling competition. There are no obvious differences between these two platforms about supported social media networks. Populizr and HootSuite provide support to almost the same major networks. Both social media applications allow you to post content to multiple social media networks at once. Also, you can choose the time you want to publish your content by selecting different scheduling timing for each network. 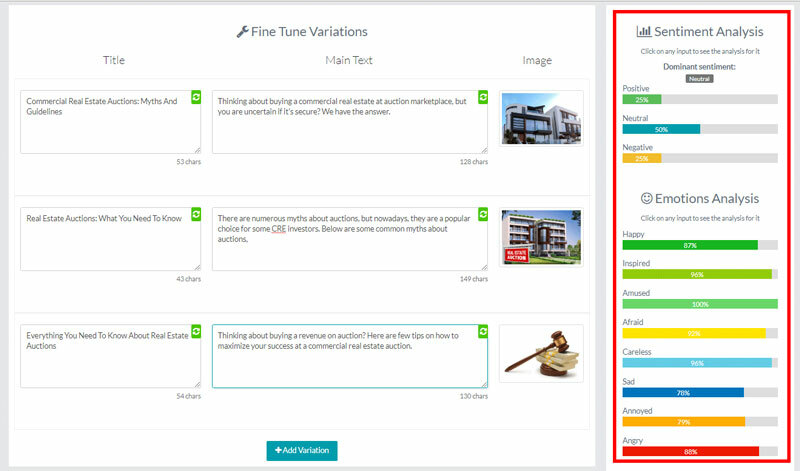 With Populizr you can automatically generate 25 different and unique variations of a single post. It is the first social media application on the market that helps you generate more variations of your posts with its ability to change the title, meta description or images on each scheduled content. That will help you to avoid content duplication because you may know that Google doesn’t want duplicate content. 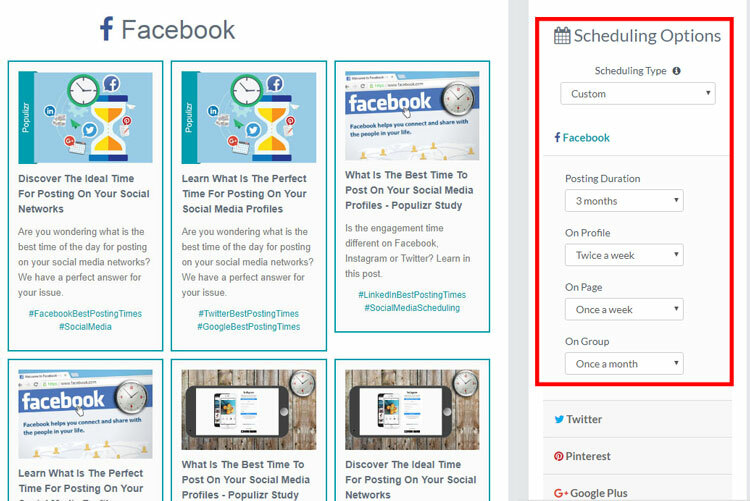 Or, you can create your Custom scheduling type, to keep social media traffic coming to your blog. 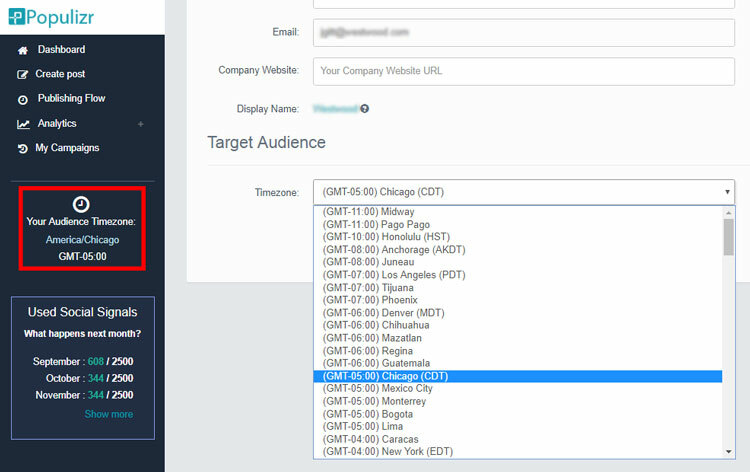 ‘Target Audience Selector’ from Populizr platform will help you to put the right content in front of the right audience because you can decide who you want to target. Hourly Breakdown (You can see posts each day and make changes before they are published). 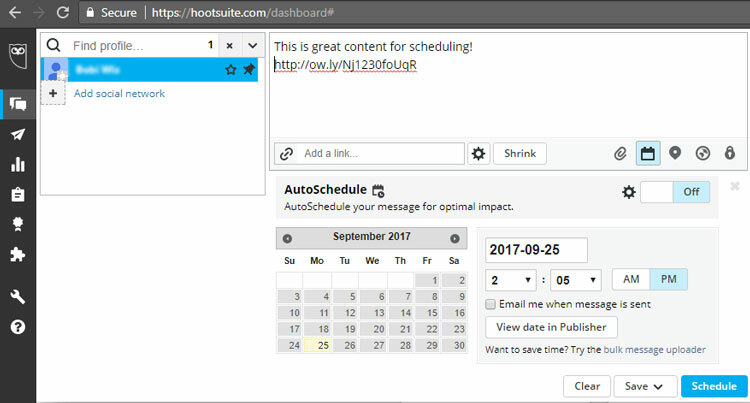 HootSuite is a nice scheduling tool for managing social media content because you can set your own scheduling time or leave the application to choose the best time for publishing. You can manage your social media calendar and track all of your past posts on different platforms. All of that displayed in daily, monthly or weekly view. Auto schedule – will help you to choose the best time for your posts to publish on different networks, based on the success of previous posts. Drafts – this feature enables you to use a draft as a template of sorts. Schedule on a particular date – pick specific time or date. 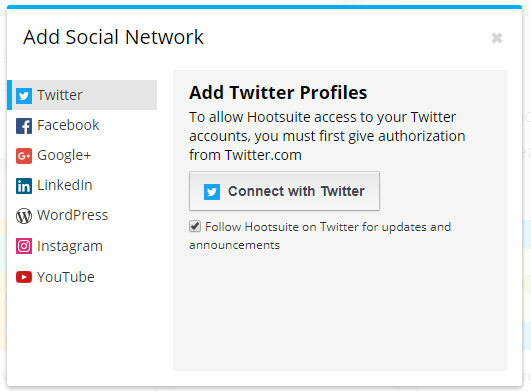 If you are using HootSuite Auto Scheduling option, you can have 24/7 presence on every social media network you want. That allows you to spend more time to find engageable content to your audience. Auto Schedule also defines the optimal posting time to any network. HootSuite allows you to publish content to multiple social media networks at once or to respond to the content by replying to each post. 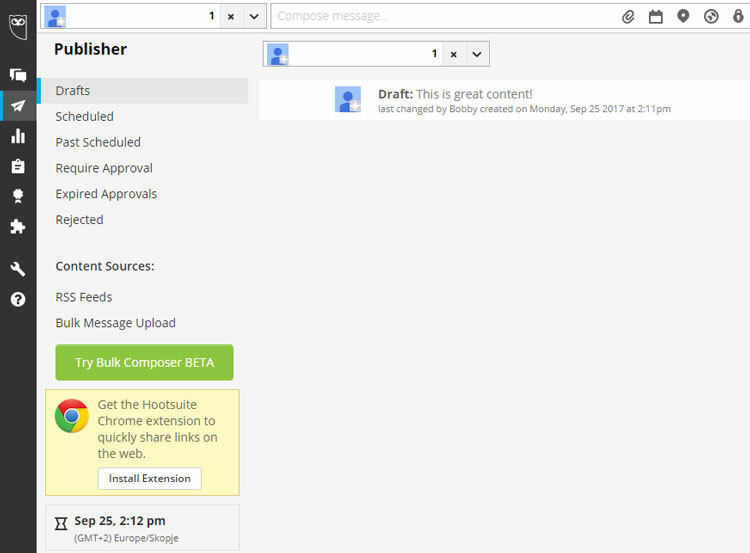 It allows you to post content from RSS feeds using HootSuite Syndicator. If you put a HootSuite Chrome extension and if you add your favorite blogs, you will be able to follow them and see the latest posts. 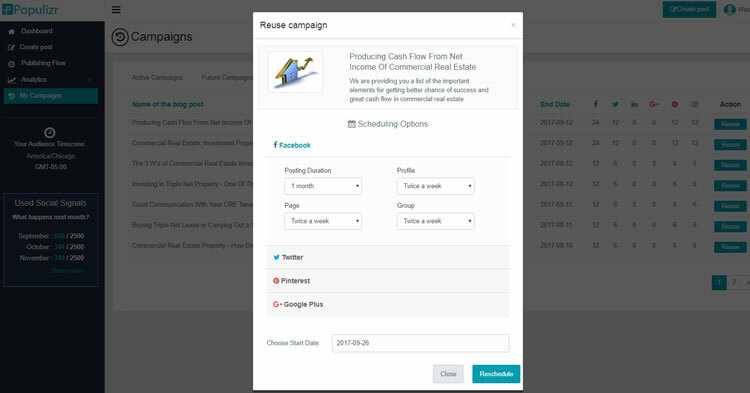 HootSuite limit the number of reports you can receive, few reports are included in the basic plan, but additional reports cost extra. As you can see from our overview of both social media platforms, they have pretty much the same features. However, there are few extra features that are supported in Populizr and cannot be found on any other social publishing platform on the market. The main reason why choose Populizr is that it shows you how emotional your social updates are. The built-in ‘Emotions and Sentiment Analyzer’ will help you realize how your audience reacts to your social media content. On Populizr Campaign dashboard you can get an overview of active, future and finished campaigns. The beauty here is that in the Finished Campaigns tab you can find an option for reusing the already published campaigns. In addition, with Populizr WordPress plugin, you can save your time drastically by pulling the key data from your WordPress blog posts and creating a social posting campaign in less than a minute. Both social platforms, Populizr and HootSuite, have pretty much the same functionalities that allow you to schedule social media posts. They, both offer you to manage your social media accounts from one dashboard. But you can notice that Populizr offers a complete automation of your posts by using an auto-pilot for posting multiple social updates from one blog post. And in our opinion, that can be a deciding factor in choosing Populizr for your business. We think that by now we helped you to decide about your new favorite social media scheduling tool. Now it’s up to you to take action and make a wise move about where you will invest your valuable time and money.